The bomb also had a parachute to slow its drop, giving both planes time to fly around 30 miles away from ground zero before the nuke detonated. This gave Durnovtsev and his comrades a chance to escape. 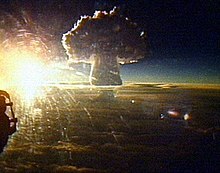 Its mushroom cloud boiled up into the atmosphere until it was 45 miles above ground zero — essentially, the lower boundaries of space. The top of the mushroom cloud spread out until it was 60 miles wide. The nuke’s thermal pulse burned the paint off of both planes. The designers originally intended the bomb to have a 100-megaton yield. They used a three-stage Teller-Ulam lithium dry-fuel configuration— similar to the thermonuclear device first demonstrated by the United States during the Castle Bravo shot. The reason was accuracy. Or rather, the lack thereof. Because of the NATO alliance’s nuclear advantages, the United States could place bombers and intermediate range ballistic missiles fairly close to Soviet targets in Eastern Europe. By the late 1950s and early 1960s, America placed intermediate-range ballistic missiles such as the Thor in the United Kingdom and Turkey, and Honest John and Matador missiles in West Germany. Consider the damage a 100-megaton version of the Tsar Bomba could inflict on Los Angeles — say, if detonated directly above the U.S. Bank Tower, the second tallest building west of the Mississippi River. As for Sakharov, his experience building and testing Tsar Bombachanged his life, prompting him to abandon weapons research. 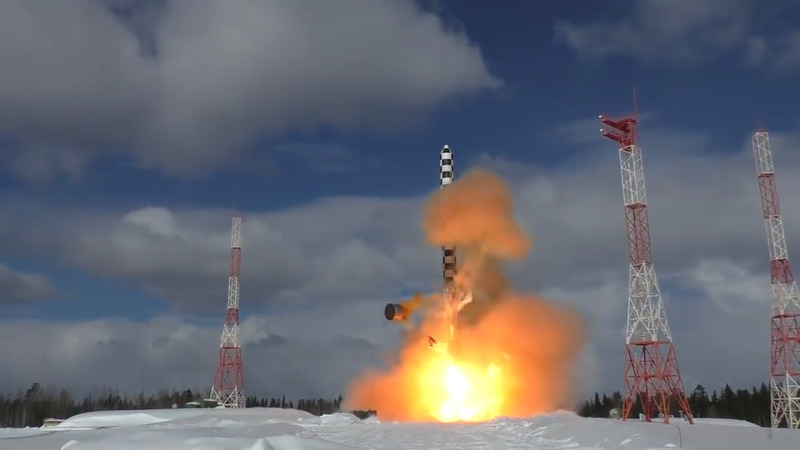 Russia’s most powerful nuclear-capable intercontinental ballistic missile has been undergoing its final stage of testing, with other advanced weapons on the way and some already in service. „The Avangard missile system with a boost-glide vehicle—our hypersonic intercontinental system—will considerably enhance the power of the Strategic Missile Forces. The final tests involving the Sarmat intercontinental ballistic missile have been a success,“ Putin told those in attendance. „As you may know, the Kinzhal hypersonic system and the Peresvet laser system have been put on alert duty. „The navy’s new surface ships and nuclear submarines will be armed with advanced types of weapons, including the Tsirkon hypersonic missile, which has no parallels in the world in terms of range and speed,“ he added. Russian Defense Minister Sergei Shoigu later told reporters that the Sarmat had reached „the next stage of testing.“ Shortly after Putin described the Avangard—a weapon that Moscow has claimed could travel up to 20 times the speed of sound—as an „answer“ to U.S. aspirations for a global missile shield, Shoigu announced that the weapons system capable of being fitted to the Sarmat would be „combat alert“ by December. Secretary of State Mike Pompeo told the Senate Foreign Relations Committee on Wednesday that, though „there are some arguments on the edges each, but largely [the Russians] have been compliant“ with the treaty due to expire in 2021. A group of Cold War-era policy veterans have sounded the alarm about the potential for nuclear war with Russia. Former Secretary of State George Schulz, 98, former Defense Secretary William Perry, 91, and former Sen. Sam Nunn, D-Ga., 80, penned a joint op-ed in the Wall Street Journal Wednesday warning that the U.S. is caught in a “policy paralysis” with Russia that could lead to military confrontation or the use of nuclear weapons. “A bold policy shift is needed to support a strategic re-engagement with Russia and walk back from this perilous precipice. Otherwise, our nations may soon be entrenched in a nuclear standoff more precarious, disorienting and economically costly than the Cold War,” the men write. The three contend that because both countries’ foreign policies are so intertwined, the risk of potential confrontation and disaster is heightened. “Since the crises broke out in Ukraine and Syria in the past few years, U.S. and Russian forces have again been operating in proximity, increasing the risk that an act of aggression, followed by an accident or miscalculation, will lead to catastrophe,” they write. The statesmen list three main goals as comprising a comprehensive approach to decreasing the risk of conflict between the two nuclear powers. First, they contend the U.S. must address its own “dysfunctional Russia policy” by bringing together a bipartisan group of leaders to work on renewing dialogue with Russia. Secondly, they say that President Trump and Russian President Vladimir Putin should announce a joint declaration reaffirming the dangers of nuclear war and the need for it never to be fought. 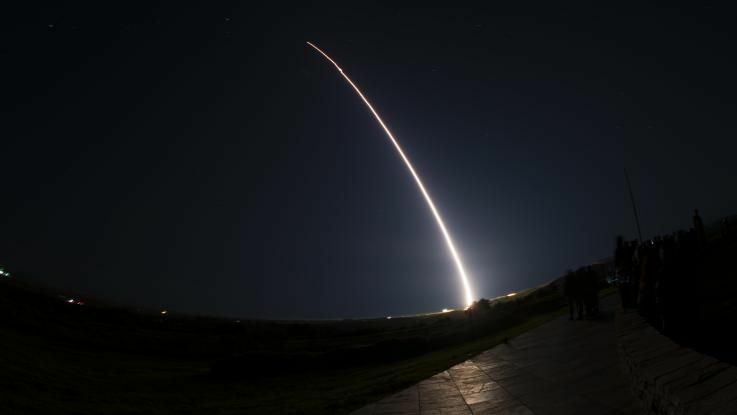 Schulz, Perry, and Nunn argue that without renewed engagement between the U.S. and Russia, risk for nuclear war could reach levels that surpass that of the Cold War. “It is essential that we re-engage with Russia in areas of common fundamental interest to both nations, including reducing reliance on nuclear weapons, keeping them out of unstable hands, preventing their use and ultimately ending them as a threat to the world,” they write. Schultz served under President Ronald Reagan as secretary of state from 1982 to 1989, Perry ran the Defense Department under President Bill Clinton from 1994 to 1997, and Nunn served as the chairman of the Armed Services Committee from 1987 to 1995. The increasingly frosty relationship between America and Iran will have been causing distress to anyone with a nervous disposition. President Trump withdrew from the Iran nuclear deal last year in order to put sanctions on the country. In doing so, he has destabilised a delicate political situation which had brought together major world powers in an agreement which limited Iran’s nuclear capabilities. However, Trump baited further hostility on Monday when he referred to a section of the Iranian army – the Islamic Revolutionary Guard Corps – as a “terrorist group”. Iran’s President Hassan Rouhani responded with a concerning warning. This was reported by Iran’s Fars News Agency and betrays an aggressive mindset towards the US from the Iranian president. Having agreed to repurpose and reduce its nuclear facilities, this statement could be interpreted as a clear sign of non-compliance in the nuclear deal which Iran signed in 2013. As for the capabilities of these missiles, Iran claimed in 2017 that they have missiles with a range of 1,200 miles (1,930 km). However, the worrying activity doesn’t stop there. According to the Associated Press, Iranian lawmakers met for a parliamentary session on Tuesday wearing paramilitary uniforms and chanting „death to America“. Supreme Leader Ayatollah Ali Khamenei, who was president of the country for most of the 1980s, praised the work of the Islamic Revolutionary Guard Corps (IRGC) and condemned the US, stating that “evil designs” would not harm them. He also pointed to the downing of Iran Air Flight 655, which was taken down by US forces in 1988. Following the incident, Vice President George HW Bush stated: “I’ll never apologise for the United States of America, ever. I don’t care what the facts are.” Two hundred and ninety civilians died in the attack, including sixty-six children. In a matter of months, Bush would be president. In addition to a number of foiled plots against the US and its allies, the administration made reference to the 1996 Khobar Towers bombing in Saudi Arabia which left 19 American servicemen dead. America has historically had a fraught relationship with the nation of Iran, the 1953 Iranian coup marking the first time the US attempted to overthrow a foreign political regime during peacetime. The overthrowing of Prime Minister Mohammad Mosaddegh, in favour of the monarchical rule of Mohammad Reza Pahlavi, was in the political and economic interests of the United States and United Kingdom, who also intervened. Over the ensuing half a century, through hostage situations, terror attacks and open hostility, Iran would continue to have a fractious relationship with the US. Following the 9/11 attacks, George W Bush famously referred to Iran, Iraq and North Korea as an “axis of evil”. Aerial surveillance operations, launched from Iraq in which the US now had a foothold, repeatedly provided no new information. There are continuing concerns in the global community regarding democracy, diplomacy and human rights in Iran. World powers have continually questioned whether the country is stable enough to hold a nuclear deterrent. However, with the leaders of both the US and Iran publicly flexing their military muscles, it seems that perhaps neither country should be trusted with such an arsenal. RUSSIA could “be forced” to deploy missiles capable of firing upon the “whole” of Europe, the Russian Ambassador to Washington has warned. Anatoly Antonov told The Moscow Times on Monday if the US were to position new missiles in the territory of allied European countries, Russia will respond by deploying their own. He said Russia is “concerned” that this eventuality is more likely now the US has withdrawn from the Intermediate-range Nuclear Forces (INF) treaty. Signed in 1987 by the US and USSR, the INF treaty was an arms control treaty that banned intermediate-range land-based ballistic missiles and cruise missiles. US President Donald Trump withdrew from the treaty on February 1 this year, after accusing Russia of violating its terms. He added: “We will be forced to deploy our missiles. He was speaking at the Henry L Stimson Centre, a Washington security think tank and reportedly displaying a map of Europe. Last week, Russian President Vladimir Putin signed a decree formally suspending Russia’s participation in the INF treaty. He has warned that Russian missiles could be turned to target US sites in Europe as well as “decision-making centres” in the US if their rival were to deploy more missiles in Europe. Putin said: “We don’t want confrontation, particularly with such a global power as the US. First Deputy Defence Minister Army General Valery Gerasimov warned that Trump’s withdrawal from the INF treaty could foreshadow him abandoning other arms agreements. According to Russia’s Tass news agency, he said: “In 2002 the US unilaterally withdrew from the Anti-Ballistic Missile Treaty. “Their next step after demonstratively suspending their participation in the INF treaty could be the withdrawal from the New Strategic Arms Reduction treaty. He said Russia would “respond with reciprocal and asymetrical measures”. But the system, known as „Perimeter“ or “Dead Hand,” may be back and deadlier than ever.